RUTH GERALD was Professor of Piano between 1965 and 1999, Head of Keyboard Studies from 1992 until August 1999 at the Royal College of Music in London having previously been appointed Faculty Adviser for Keyboard Studies in 1987. Her career has always pursued a very wide path - solo and lecture recitals, concertos, chamber music, Lieder recitals, accompanying, adjudicating, examining and teaching and giving masterclasses. She was Head of Keyboard Studies at the Birmingham School of Music (now the Birmingham Conservatoire) for a period of five years but relinquished this post in order to devote more time to performing, and teaching at the Royal College where she was Professor of Piano and Piano Accompaniment for over 30 years. 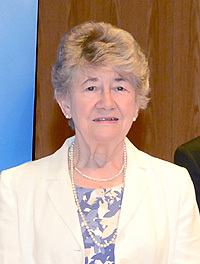 She was elected a Fellow of the Royal College in 1985. Born and educated in Australia, Ruth Gerald began her musical career there, broadcasting regularly with the Australian Broadcasting Commission at a very early age. After winning the Elder Overseas Scholarship and gaining a Bachelor of Music degree at Adelaide University she continued with postgraduate studies at the Royal College where she was awarded many prizes, including the Hopkinson Gold Medal. She has given Masterclasses in the UK, Ireland, Australia, New Zealand, Malta and Greece and conducted many Seminars for piano teachers in the UK, Malaysia, Singapore, New Zealand, Hong Kong, Macau and Taiwan. She is frequently invited to adjudicate Festivals world-wide and is actively involved in many aspects of the work of the Associated Board of the Royal Schools of Music.